OSLO (Reuters) - Norsk Hydro, one of the world's largest aluminum producers, battled on Tuesday to contain a cyber attack which halted parts of its production, the latest example of the damage hackers can cause to business and industry. 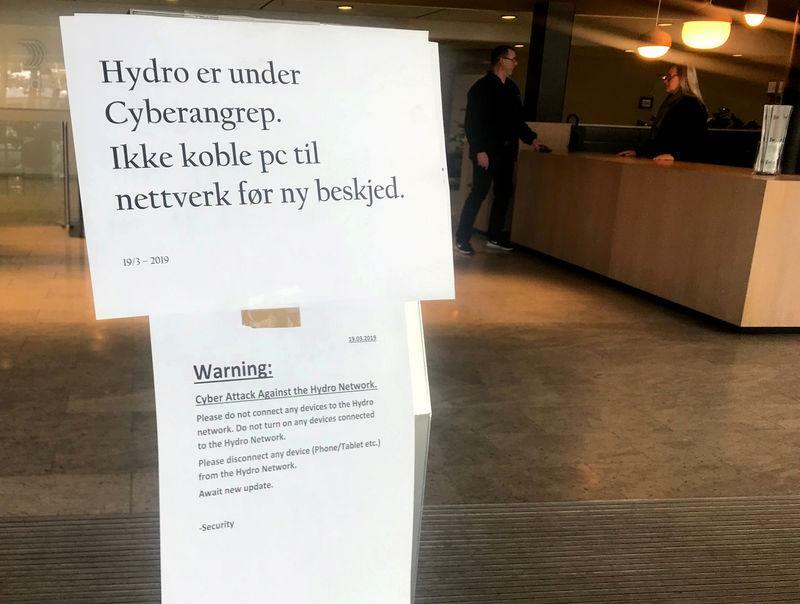 "This is a classic ransomware attack," Chief Financial Officer Eivind Kallevik told a news conference, adding that the company had not identified the hackers. "The situation is quite severe." "We have good back-up systems and we have plans on how to restore it," he said. The attack began in the United States on Monday evening and escalated overnight, hitting IT systems across most of the company's activities and forcing staff to issue updates via social media. "It is too early to indicate the operational and financial impact, as well as timing to resolve the situation," Hydro said in a regulatory filing via the Oslo Stock Exchange. "It is mostly direct labor: some of the activities that we use computers to do, today we use manual labor. We have to add some more people," he told Reuters. News of Hydro's plant outages pushed aluminum prices to a three-month high on the London Metal Exchange. The company's shares fell as much 3.4 percent before recovering to trade 0.8 percent lower by 1438 GMT. Haakon Bergsjoe, head of NNSA's National Cyber Security Centre, said there were no reports of other companies affected on Tuesday. All major Norwegian companies had been warned in the wake of the attack on Hydro, he told Reuters. Other cyber attacks have downed electricity grids and transport systems in recent years, and an attack on Italian oil services firm Saipem late last year destroyed more than 300 of the company's computers. The company's hydroelectric power plants were running as normal on isolated IT systems unaffected by the outage, as was the alumina operation and smelters located outside Norway, including in Qatar and Brazil, Hydro said.